I am a new gardener and I have been binge reading discussions here. So good! I need help designing my borders please in terms of plants for all year round interest .I don't mind perennials and annuals but I also like something that brings interest and structure in the winter. I have a South facing garden and my borders are the East facing wall (gets sun all day) and the north facing wall (gets full shade all day. Soil seems to be clay and not particularly water logged. I currently have all these in pots: Japanese maple Katsura, Camelia Japonica, Azalea Japonica Nancy of Robin Hill, Polystichum setiferum (AGM) Fern, Hebe Variegata and Hydrangea (I don't know the name). Here are the other plants I have but yet to plant... I don't have to plant them all as I could return them to my local nursery where I purchased them for a voucher towards other plants. I realise I might have overdone it and still need perennial and other plants but I'll stop rambling now and listen for your welcomed help and advise. I just want a lush looking garden with lots of flowers. Thank you so much and happy gardening. Hello MrsDee ! Can you give some idea of the size of each border please? It will help with working out the spacing etc. Hello AnniD. Thank you so much for your response. I think the East facing wall is about 2ft wide and about 30ft long and the North facing wall is the similar in width but a shorter length, perhaps 20ft. I'll take a picture in the morning and attach it here. One mistake you haven’t made that I did is having too few plants, good luck! Oh Tin pot, you don't know how much it warms my heart to hear that. I started last spring and I am proud I haven't gone overboard. I have just remembered I actually also have a magnolia stellata waiting to be planted. No plant shortage here. Hehehe.. 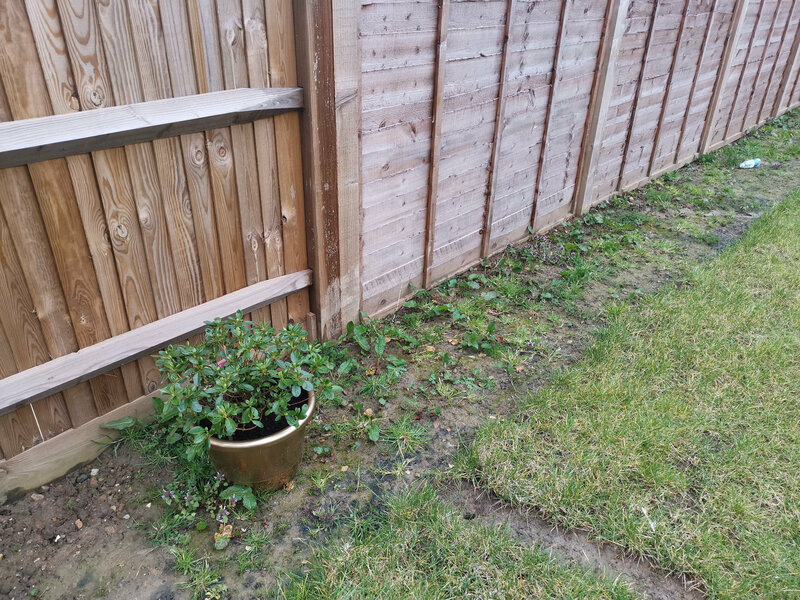 Attached is a photo of the border to give an idea of the area. Weeds have overtaken the borders seeing as I had them prepped since end of last summer. I am waiting for trellis to go up above the fence so I'll prep the border again once that's done. 2ft seems very narrow for many of the shrubs on your list, would it be possible to make them 3ft or vary the width a bit where you can with a curved or wedge shaped border so you have more width for the larger ones? Its worth looking up the spread of each of your plants, thats important when planning what goes where and how much space to allocate each, as AnniD indicates. What is your soil PH, do you know? Are you planning to keep the acid-lovers like Azaleas and Camellias in pots? Morning MrsDee l agree with Nollie, you really need to make those borders a lot wider. As well as more benefit to the plants, it looks much better than having them all lined up against the fence and squashed up to it. You've got a good length of garden there, so l think you can afford to be generous. As well as the style of bed, you need to prepare it well. It looks like a fairly new build, so it's more than likely there's a load of builder's rubbish underneath. It takes a bit of time, but it's worth it. Good morning and thank you Nollie and AnniD. Again, as I said, I don't have to plant them all. I could always take them back to pick up other plants. Unfortunately, I don't know the soil PH. I went to the garden centre back in January to purchase a tester but they had sold out. I'll go back again. Yes, I plan to keep the Azalea and Camellia in pots. I have potted both using ericaceous soil. Would it be ok leaving them in pots? AnniD, any suggestions in prepping my beds? You are right, it is fairly new build and I have a tiller and bags of compost but that's about it. What do I need to do? The first thing to do is to mark out the beds. If you want curves, the best thing to do is use a hosepipe (if you haven't got one, you're going to need one for watering, so add that to the list!). If you're going to have straight lines, canes are probably the best thing to use. When you've got it how you think you want it,go upstairs (I'm assuming you don't live in a bungalow ! )and look down at it. Keep tweaking until you're happy, then the fun begins. Using a spade, cut along the length of your hose or canes. Shift them out of the way and start by lifting the turf. You can hire a machine to do this if you want to - there are videos on Youtube showing ways of doing it by hand or the machine. Stack the turves you remove in a corner somewhere if you can, grass side down. They will eventually rot down giving you stuff you can put back on the bed in the future. Now start digging or tilling. Clear the bed of any weeds, rubble etc. I would advise digging it down at the very least a spades depth, two if you can. You may well find there's a "pan" underneath, if it's really compacted, you may need a pickaxe to get through it and loosen it a bit to help the drainage (Hope this doesn't sound too off putting, it's just worse case scenario based on experience !). When the site is cleared, you can dig in compost, well rotted manure etc. Make sure you have ample supplies of tea,coffee and biscuits. Oh thank you AnniD, you're so very kind. That's very thorough and I appreciate it. I forgot to add that I actually have a few tools I have been gradually buying: spades, shovel, hand trowel, kneeling bad, water hose, watering can, and that snipping tool (can't remember the name)....wow, check me out with all my tools. I really do mean business don't I. I also joined the gardening society in my town (yes we have one). You got me reeling with laughter at you may find a pan! I guess anything is possible really. It's not off putting AnniD as I having watched videos and all, I know it's hardwork but one that rewards so I am up for it. Infact, I designed my patio area (the actual south facing part of my garden) end of last summer so I know it's hard work. 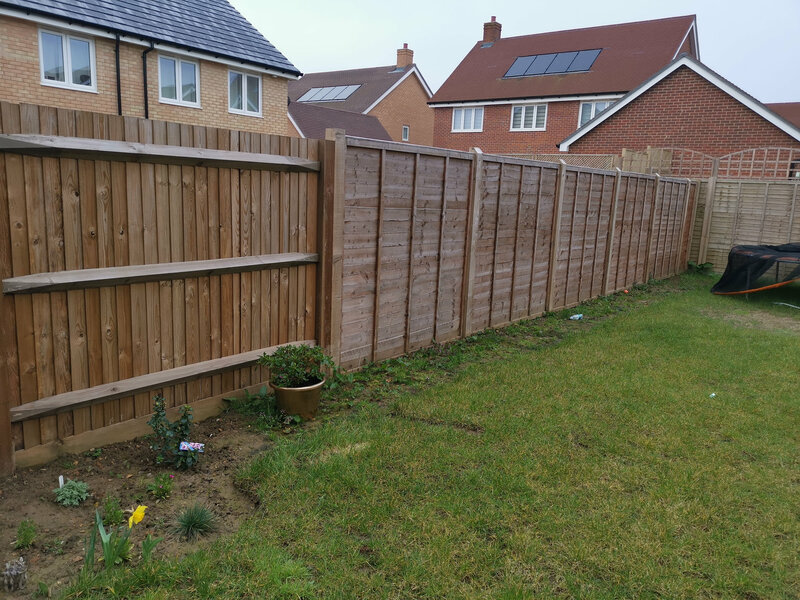 I planted a lavender hedge, some primrose to fill in the gaps whilst waiting for the lavender to fill in as they are baby ones, some sweet Williams, rosemary, thyme, sage and blue grass. That's the area you can see cut out slightly wider than the border to the left in the photo. However, I didn't dig in compost or rotten manure so thank you for mentioning that. Better visit my nearest shop to stock up on those tea bags and biscuits. Hehehehe. I think my main issue right now will be convincing DH to widen to beds. He doesn't want to decrease the lawn size so that we still have space for other things. I most definitely have been bitten by the gardening bug. I sure will be back with more questions on other topics. Tell me about the problem with men and lawns ! My OH is the same, l have spent years cunningly cutting away at the edges of the beds with a trowel as l go round weeding. Trouble is, he could always tell when l'd done it as the edges were so wonky. I just looked innocent (l'm very good at that ). You could always try pointing out how much the plants cost, and he wouldn't want them to die due to lack of room because then you'd have to splash the cash again . (You can tell l have had years of practice at this). Have fun !